I will upload the file when the GUI in the new version will be ready. how is development going? making any good progress, hope you will still have some kind of lava in this next update! Good luck! Thanks for working on making lava!! Have you take a peek at the first message of this thread? Read the last 5 or so pages. how is development going? Have you take a peek at the first message of this thread? Maybe because it isn't done yet. There are some WIP pictures of lava on pages 25 and 27. I don't pay attention to the list, besides, it's a lot better to read the posts to see whats going on, I read the new posts every day or so. 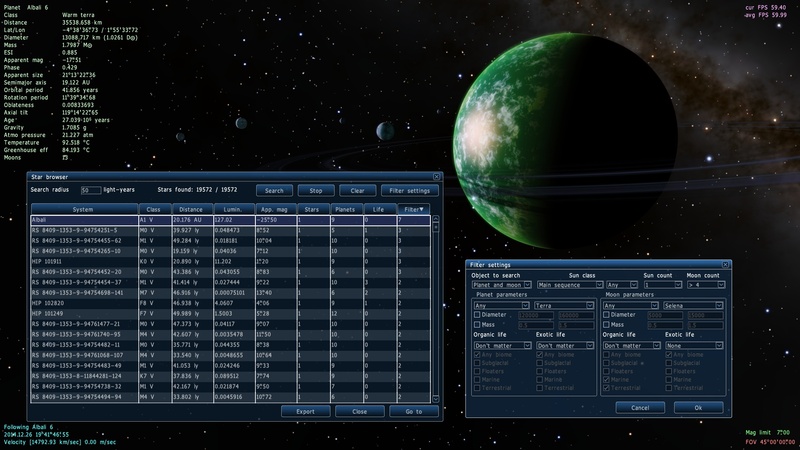 I made something you are really like - the parametric planet searcher. It is an option of the old star searcher: ability to set up a planet/moon parameters filter. Once set up, the searcher will examine each generated planetary system and count the number of planets/moons that match the filter. This count is output in the last column. Of course this is a cheat feature and will be disabled in the game. In the game players can search planets only through a server database of discovered planets. This is a key gameplay feature. But maybe this searcher must be disablen in the planetarium too? It is too easy to find a terra with life now. I made this system for developing purposes, to be able to find specific planet type more easy. Awesome! I think the best option is to make a Line-Command cheat to enable search functions in planetarium mode. So if someone doesn't care about spoilering the gameplay can still do that. Question: Does the "filter" thing decreases search speed? No, generating the planetary system is much slower than checking the filter for each body in it. Of course, in the actual "game" this doesn't have to be the case. But for the Planetarium? Absolutely include it. But maybe this searcher must be disablen in the planetarium too? No, I think it should be available for everyone. As QuietlyConident said, there are people - many people - who use the program for purposes of building their own universes and seeking inspiration for their personal creative projects. Hiding the filter would make this a lot harder for them. Also, the filter would make it much easier for new users to discover all of the possibilities that SE has to offer, which could help them to become more interested. In short: I strongly believe the filter should not be hidden. I think Space Engine in Planetarium mode should have any sort of search function accessible from anywhere (and it is, this is not criticism on what's done), so finding what you want is fast, easy and reliable. Need a world with a terra orbiting a gas giant? No problemo, you got thousands of them waiting for you to be searched. Ideally that should make no spoiler problems as the game and the planetarium would have different seeds and probabilistic parameters, so that universes are not the same. Nice! I'll be able to find more high ESI planets that way. I hope, when you do release the game version, that you make it possible to play offline (without Internet) as an option. That way people can still play, even if their connection is lost for extended periods of time. Also, please don't charge people a monthly fee for playing on the server. I want to be able to play it for free (as in 100% free), not "Pay-to-Play" (subscription) or "Free-to-Play" (surviving on buying extras), even if there is an initial, one-time payment (which I hope there isn't)! Otherwise, I won't play at all (I hate it when they charge monthly fees for playing online games! ). Also, if you (hopefully) do make the game version free, PLEASE make it open-source. 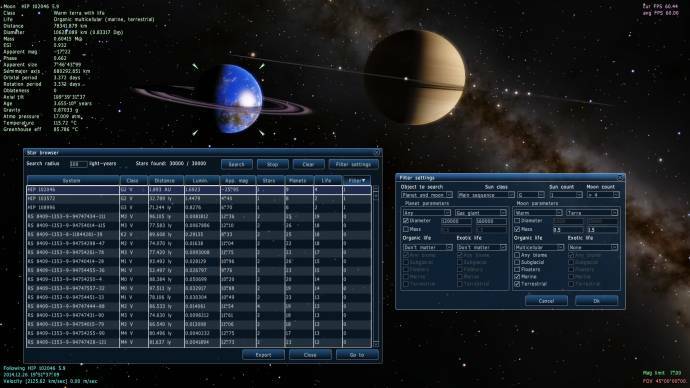 I want to look at the source code and see what the random seed number is for the planets generator.